The morning sun shines over the Mumbai slums. It is the beginning of a new day, and GFA-supported pastor Marty reaches into his bag and pulls out some literature. In his heart, a passion of love for the people he knows are hurting grows inside him as he looks around the tarp-covered huts. He scans the dirty faces of slum dwellers and realizes today might be the day they could understand how completely they are loved by God. Across the globe, as the sun shines on the small town of Wills Point, Texas, Jonathan stares at his computer in front of him. He glances over at the pictures on his office wall and remembers the masses around the world who are waiting to know they are loved. Both men have completely different tasks and roles, but they understand something profound—they couldn't do their job without each other. Before becoming behind-the-scenes missionaries at GFA, Jonathan and his wife, Erica, lived fairly normal, routine lives: Jonathan had worked at the same job since he graduated college; the couple had lived in the same home for 16 years; and they had been involved in the same church for 12 years. When the eldest of their four daughters was 4 years old, they welcomed GFA-supported Bridge of Hope children and missionaries into their lives through prayer and sponsorship. 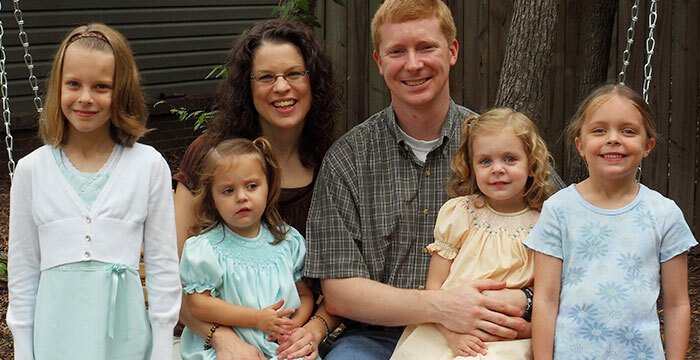 Jonathan and Erica wanted their children to grow up understanding the needs of others. Ever since their four beautiful daughters were young, Jonathan and Erica have led their family in pursuit of serving the Lord together. "They were familiar with the idea," Jonathan says, "that there are people outside of [their] own little world who have a totally different set of challenges, and people who don't know about Christ." This worldview found its way into their family's everyday life and holidays, shaping rich family traditions. 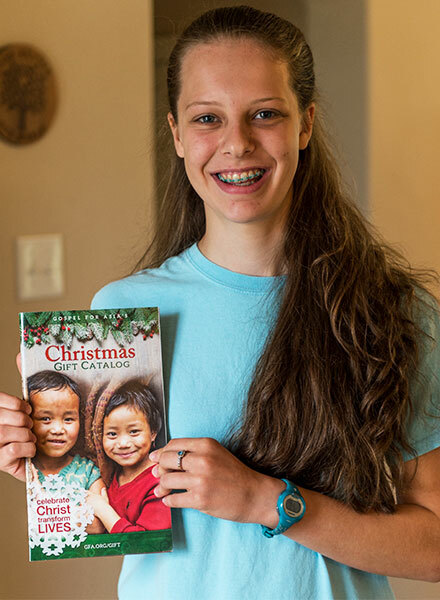 When the Christmas season came around each year, their daughters would pour over the pages of GFA's Christmas Gift Catalog, flipping through the pages filled with pictures of chickens, goats, Bibles and blankets. Their house stirred with excitement as each bright-eyed girl got to choose an item to bless a person or family in Asia. Half a world away, GFA-supported workers like Marty would later deliver these gifts to the people in their communities who desperately needed help. Together with many others in the Body of Christ, they were seeing lives transformed through Christ's love. When Hannah (pictured), the oldest daughter of Jonathan and Erica, was 4, the family began supporting GFA. It became a favorite family tradition to go through the Christmas catalog together every winter to pick out gifts for needy people in Asia. Eventually, the Lord entrusted Jonathan and his family with another opportunity to serve Him and the people around them in a deeper way: starting a small fellowship in their home. Through the years, Jonathan and Erica watched as God blessed their fellowship. Missions was in all of their hearts, and the fellowship provided the funds needed for a church building in Asia and sponsored and prayed for GFA-supported national missionaries. But as time went on, God slowly began to change the course of this fellowship. "The [fellowship] had always been kind of a stopover point," Erica says. "A lot of people were there for about a year. It was like it was a respite, sort of a hospital, maybe spiritually speaking." This similar pattern lasted for several years. People would come to the fellowship and then go, but the Lord always brought another family or individual to fill the empty seats. As faces and seasons changed, missions began to burn on Jonathan and Erica's hearts more and more. During these months, they watched as God relocated families and drew people out of their fellowship and to the local churches. Meanwhile, the empty seats left behind stopped being filled. "Now we can see," Erica says, "that He was shutting it down so we were free to go." As the Lord continued to press missions on Jonathan's heart, a revelation struck him: Why not serve in the place where they had already been investing for the past nine years? "It wasn't that we chose GFA because we thought it was the most prestigious, or because we thought it would be the best place for our family, or the easiest place, or the most fun, or the most spiritual, or any of those things," Jonathan says. "We're here, and we remain here, because this is the one God chose." After raising monthly support for their livelihood, Jonathan and his family packed up their home and moved to Texas to join GFA's staff as behind-the-scenes missionaries. They were ready to serve the Lord together once again and in an even greater capacity. As missions continued to burden Jonathan and Erica's hearts, the Lord called their family to serve in the place where they had already been invested for years. After much prayer and seeking the Lord, they moved to Texas to serve as behind-the-scenes missionaries in Wills Point, Texas, at GFA. With passion and excitement, Jonathan started serving in the IT department at the GFA office in Wills Point, Texas. Through his work, he was able to equip his fellow behind-the-scenes missionaries with the computer systems they needed to accomplish their jobs in helping missionaries in Asia, like Pastor Marty. As Jonathan worked with software updates, Pastor Marty prayed for widows struggling to make ends meet in their small huts deep in the slums. As Jonathan prepared for meetings with vendors, national workers prepared Sunday messages for their growing congregations. As Jonathan helped equip the Texas office with the systems needed to communicate with donors and sponsors, Pastor Marty and many other GFA-supported workers talked with broken families about the love of Jesus. With Jonathan and the other behind-the-scenes missionaries doing their part in their work, Pastor Marty and fellow ministry workers could more effectively do their part. Jonathan knew his work was important, but he quickly began to realize that working for a ministry was no simple task, and at times it was strangely not unlike working for a company in the secular world. Within the office, he still experienced problems with computer software and challenges in working alongside others whose personalities clashed at times. "It turns out," Jonathan says, "all the same problems you encounter in the business world, you typically are going to encounter in the ministry world, too." Although Jonathan worked with people and computers as he had in his secular job, the differences of working in a ministry impacted his walk with the Lord. Whereas before he never thought to pray for a broken computer server or start a meeting in prayer, he now found himself doing these very things. Once, when Jonathan had broken the entire office's email system, it disabled the behind-the-scenes missionaries for several hours. To his amazement, Jonathan didn't receive the same kind of treatment he would have experienced in the business world, with his bosses telling him how much money and time he was wasting. Instead, people stopped by his office to encourage and reassure him that they were praying for him. When Jonathan finally got the system working again, a slew of emails filled his inbox. They were from folks around the office thanking him for all his hard work on getting the problem fixed. It was this kind of grace that Jonathan had never experienced before, and it occurred to him that the GFA office had a completely different atmosphere. Instead of pressures to do everything correctly the first time, there was love and grace shown by his coworkers. Instead of stress, there was peace as problems were brought to the Lord in prayer. "I realized I am in a different world here," Jonathan says. "Everything matters so much more, but mistakes are handled with so much more grace. And both are tied to the heart and the attitude behind it." Behind-the-scenes missionaries at GFA faithfully lift up the needs of their brothers and sisters in Asia in prayer. Jonathan and his family have seen how their faith has increased while being a part of GFA as they join in intercession with the Body of Christ around the world. Missionaries on the field, like Pastor Marty, pray earnestly for the Lord to work in their ministry and that He would establish the work of their hands. Surrounded by like-minded believers, Jonathan and his family join in on this intercession for the men and women they serve across the globe. Every Tuesday night and once a month on Friday nights, the family gathers, after a quick dinner at home, inside the chapel located on the GFA campus for prayer. "Prayer is a great leveler," Jonathan says. "It's a sport in which everyone is equally able to do the work. There are differences in spiritual giftings and heart and all of those things, but there is nothing about the fact that if you are 10 that you cannot be as effective in prayer as someone who is 30 or 40 or 50 or 70." Through the prayers of the saints, lives are being restored. As the behind-the-scenes missionaries lift up ministry needs to the Lord, lives are changing. Sisters of Compassion are given the courage they need to continue in their service to others in Jesus' name. Missionaries experience opened doors to speak truth and hope into the lives of people whom they encounter. The sick are being healed and poverty is broken as the faithful, fervent prayers of brothers and sisters worldwide are offered to the Lord. The prayers prayed are reaching places many behind-the-scenes missionaries will never physically go. 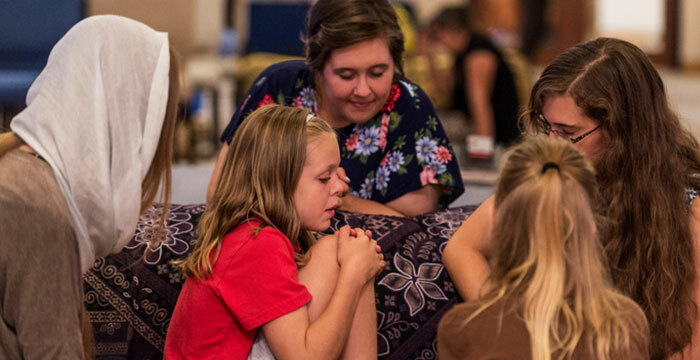 Through this part of GFA's ministry—and as people, whether in Asia or in the United States, gather for prayer—missionaries are sustained by this constant communication with God. Jonathan and his family were encouraged to see the Lord answer their prayers for the church building their home fellowship had supported and prayed for every week. After being behind-the-scenes missionaries at GFA for about 6 months, they heard news about this church building and the GFA-supported pastor. "It was such a privilege to actually get feedback about our specific church and pastor," Erica says. "To see that one decision from our little body of believers had made an impact that continues today is absolutely incredible. And it was such a boost of faith for all of us to see that God was accomplishing much through all that time of quiet prayer in which we didn't have specific knowledge, but were simply praying out of our own experiences as a church." As a family, Jonathan and Erica continue to lead their four daughters in the way of Christ and to cultivate a heart for missions. Erica and their daughters serve hands-on at the ministry, after school hours, serving behind the scenes throughout the week in various places around the office. They read missionary and Bridge of Hope profiles and letters, open mail, clean and stock the office breakrooms and clean the campus chapel. Their willing hearts to help wherever needed are evident on their smiling faces. They are happy to serve the Lord in whatever capacity He allows. But serving the Lord is not always simple or pleasant, and ministry is no easy journey. Just as Jesus warned His disciples about the trials and troubles that would come their way if they followed Him, Jonathan and his family have experienced this reality as they have labored with GFA. National workers like Marty have experienced trials and troubles, too. Although persecution may look different in Asia, brothers and sisters around the world face opposition together, knowing that serving the Lord does not come without a heavy price at times. "It had never occurred to me," Jonathan reflects, "that when you give your life at a ministry, you are not just doing the glorious and admirable thing of becoming a missionary, and everyone is going to applaud you. You are joining yourself to a ministry that will, at some point, be the target of criticism, and when it is, you also will be the target of criticism. … That was both the hardest thing for me to swallow and the source of most growth for me. … I had to learn, it's more about obeying God and trusting Him to bring fruit out of it than it is the applause of people." With an understanding of their calling and a commitment to the Lord, Jonathan, Erica and their family stand together as one with Pastor Marty and other missionaries around the world, serving others for the sake of Christ. "It's more of a lifestyle and less of a job," Jonathan says. Even when they feel tired, weak and unworthy or when criticism comes their way, Jonathan and Erica remain faithful to where God has led them. "We are here because we are about the business of allowing people who have never heard the hope of Christ to hear of Christ," Jonathan states. 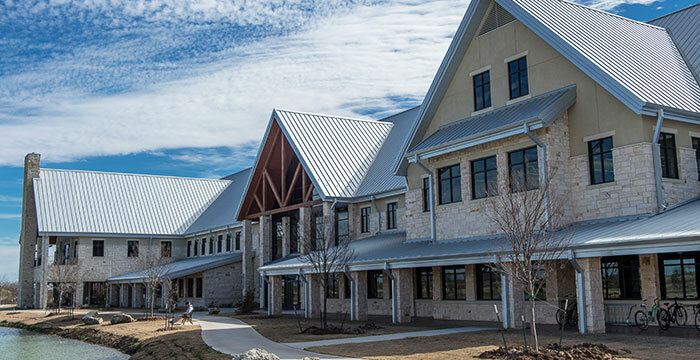 "We are also here specifically because this is the place that God connected us to 13 years ago and kept us connected to and specifically led us to. So it's both the eternal purpose and the specific circumstances working together. But it's not a matter of preference, or we wouldn't last." Jonathan and Erica are just one family out of many that serve behind the scenes at GFA.  With a diversity of single men and women, families and retired couples, these dedicated believers have come together to see people's lives touched through Christ's love and sacrifice. Burdened with the reality that many still wait to hear the simple, profound words "Jesus loves you," behind-the-scenes missionaries are committed to following Jesus even when there is a high price to pay. They serve to enable missionaries in Asia to be the hands and feet of Christ, and they need financial and prayer support to continue to minister full-time without having to work another job—just like their counterparts on the field. Behind-the-scenes missionaries have raised their own financial support since the very beginning of GFA's establishment to help counterbalance personnel-related ministry costs. But this is a difficult task, and it takes time away from other work God has entrusted to them. Through the Missions Support Team, you can help provide staff with the funds needed to live simple but contented lives as they minister to others and unto the Lord. When you link your life with a behind-the-scenes missionary, you get the opportunity to stay more connected with the Lord's work in Asia. Be a part of changing the world today by aiding the needs of our brothers and sisters here in the United States. Someday in heaven, we all will worship the Lamb of God together, and we will see fully how Christ has connected our lives with our brothers and sisters around the world!